The rule with Team SoloMid in 2016 is to expect the unexpected. With an all-star roster of proven greats, they shambled to a .500 record. Now they’re the scariest team in the NA LCS playoffs. On Sunday, they face their great nemesis, CLG, in the final. 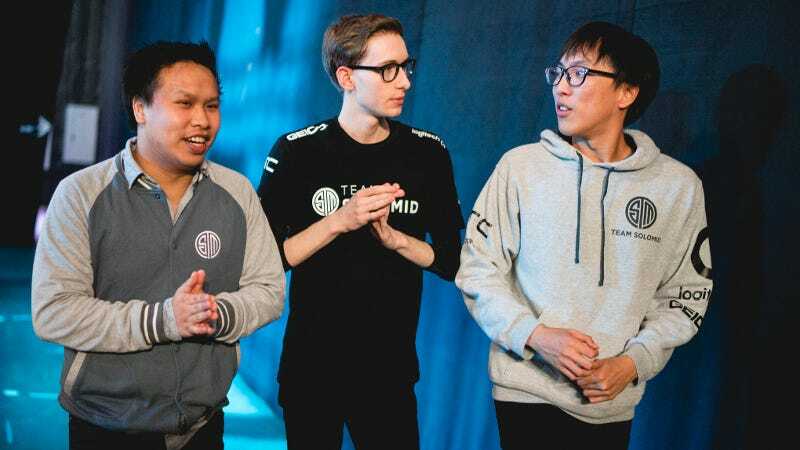 It’s a remarkable turnaround for Team SoloMid. Their win over Cloud9 in the quarterfinals was an upset, but it was nothing compared to their stunning 3-0 sweep of the near-undefeated Immortals. If you take momentum into account, TSM look like the hottest team in the playoffs and perhaps more than Counter Logic Gaming will be able to handle. On the other hand, was TSM’s win over Immortals as impressive as it looked at first glance? TSM played very well in the series, as well as they’ve played all year. But it’s also unlikely that CLG will do TSM the favors that Immortals did in their ill-fated semifinal. It’s not that Immortals completely choked or didn’t take the games seriously. The first game looked exactly like Immortals vs. TSM was supposed to look—for the first 20 minutes. In the beginning, Immortals had a fast composition built to win the game before TSM would be able to respond, and they opened up a huge lead on gold and turrets. But they treated their series against TSM like a lab test for unconventional strategies that cut against the grain of the currently dominant League of Legends strategies. It smacked of hubris. In their first game against TSM, they picked Lucian for their top lane star Huni, basically moving a character meant for one position (AD carry) and putting him into a completely different role. It’s the League of Legends equivalent of running the wildcat formation in football, but for an entire game. This wasn’t totally unusual for Immortals. Huni himself is happiest when he can play in the top lane like a traditional carry, and it gave them some truly explosive damage potential. But as damaging as AD characters are, they need to be screened from the enemy by tankier characters, as well as supported by teammates in utility roles. That’s especially true as League continues to evolve into a game where in-game roles are increasingly specialized and mandatory. People can feel differently about the drift toward unkillable late-game top lane tanks (part of me likes that Immortals are still pushing against it), but it’s undeniable that their top lane picks were a gift to TSM last week. TSM’s more standardized play crushed Immortals’ glass cannon composition. As the game continued, TSM’s Hauntzer became unstoppable because his tanky top lane character, Maokai, had absolutely nothing to fear from any of Immortals’ players, and Immortals didn’t have the ability to control how and when they would engage. The other issue that surfaced in TSM’s match against Immortals was that Immortals can’t really take a punch. A new team that’s only known success as a group, they started to come undone after TSM came back in the first game and showed that Immortals had a fight on their hands. Rather than rising to the occasion, Immortals’ decision-making went from poor to disastrous. Immortals jungler Reignover seemed to lose his ordinarily impeccable game-sense, falling way behind TSM’s Svenskeren and engaging in bad situations. He and Huni were actively costing their team games throughout that series, and it made it easy for TSM to dominate them. For Team SoloMid, it was sweet vindication after months of their players’ impressive credentials failing to translate into results. Bjergsen in particular proved that he can take control of the mid lane, and Svenskeren reminded everyone why he has been one of the most consistently in-demand junglers in League of Legends for the last few years. Immortals’ defeat set up a Hollywood ending for the NA final. TSM are facing their oldest rival, CLG, who are looking to win their second North American season title in a row following a long era of postseason disappointments. It’s also a high-stakes confrontation between TSM’s Doublelift and his old team, who somewhat unceremoniously cut him from the team shortly before the new season. CLG will probably not cede as many advantages to TSM as Immortals did. They put together a good regular season record on the strength of a lineup that has come together over a few seasons rather than a few months, and it’s unlikely that players like Aphromoo or Xmithie will collapse as completely as Huni and Reignover did. Judging from their regular season performances, CLG would still be the favorite—they’ve clearly been the second-best team in the region for the past several weeks. But TSM’s victories over these last two weeks clearly indicate that regular season results don’t really matter now. It may have taken them some time, but TSM are finally living up to their roster’s promise. Now, this Sunday, the awakened juggernaut just has to vanquish its old enemy to win the North American championship that once looked so far out of reach.